To make the pastry, place the flour, sugar, salt, butter and lard in a large bowl and, using your fingertips, rub the butter and lard into the flour mixture until it resembles fine breadcrumbs. Add the vinegar and water and, using a butter knife, bring the mixture together to form a rough dough. Roll out 1 of the discs between 2 sheets of non-stick baking paper to 4mm thick and use it to line an 18cm metal pie dish. Refrigerate for 30 minutes. Roll out the remaining pastry between 2 sheets of non-stick baking paper to make a 3mm-thick 30cm x 30cm square. Cut the pastry into 15 x 2cm-wide strips. Place on baking trays lined with non-stick baking paper and refrigerate until needed. Spread the almond meal in the base of the pastry case. Preheat oven to 180°C. Place the strawberry, rhubarb, caster sugar, vanilla and cornflour in a large bowl and mix to combine. Top the almond meal with the rhubarb mixture. 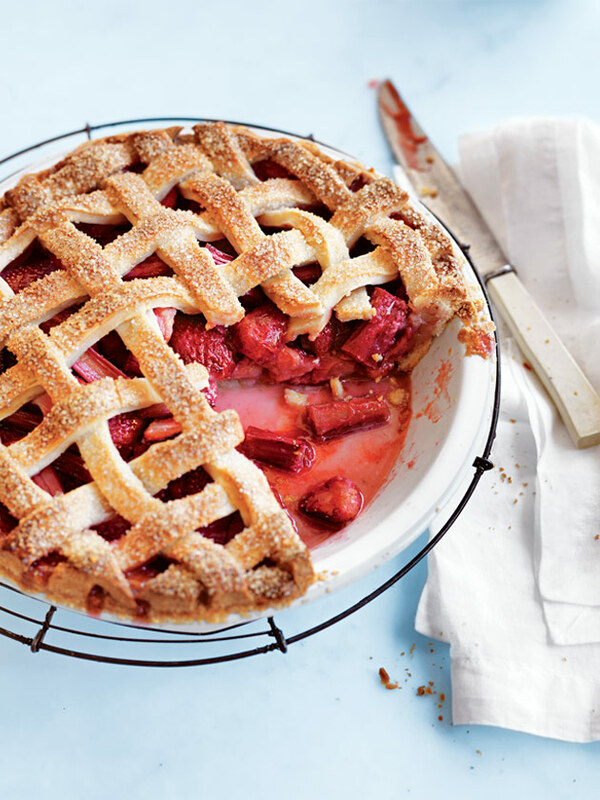 Use the pastry strips to create a lattice pattern on top of the rhubarb filling. Press the edges to seal, trimming any excess pastry. Brush the pastry with the egg and sprinkle with the raw sugar. Place on a large baking tray and cook for 60–65 minutes or until golden brown and cooked through. Set aside for 30 minutes before serving. Serves 6–8. I just made the pie this weekend and it was super delicious. My family loved it and we cut it right out of the oven .